Any household within the PPNA borders, 60th to 68th from North to Lloyd, may hand out treats. The Fall Newsletter will have the official PPNA Pumpkin to hang in your window to show your participation. This is a PPNA sponsored event, please support your neighborhood association by joining the PPNA or renewing your membership at this time. Glow Lights will be given out to participants at the membership drive. Two year members and those who have mailed in the membership form will have Glow Lights delivered to their home. There will be two PPNA sponsored CIDER STOPS. At our cider stops, we will be collecting nonperishable food items, toiletries or monetary donations for Tosa Cares. Visit http://www.tosacares.org for a list of preferred donation items. Have your little ghost or goblin give a little something back to the community for their basket of goodies! If there is a chill in the air, feel free to grab a warm cup of apple cider at either location. 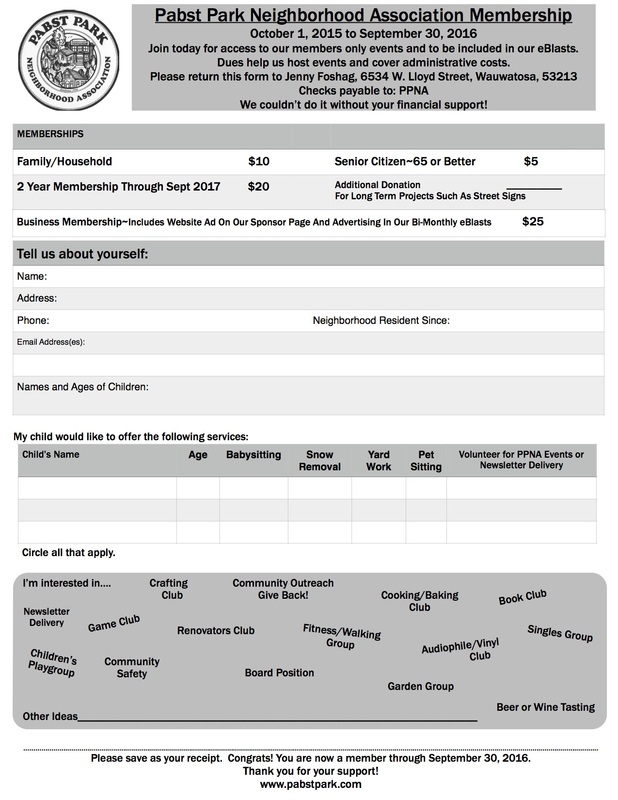 Our 2015 membership year ended on September 30th, to become a PPNA member for the upcoming membership year, please renew your membership at our membership drive or by dropping off your form and membership dues to our Membership Chair, Jenny Foshag at 6534 West Lloyd Street, Wauwatosa, WI 53213. Not sure if you signed up for a two year membership, last year? Contact Jenny, at jsbrand27@hotmail.com with questions. Drop off your membership form on Monday, October 26th and pick up your glow light for Trick or Treat. Everyone is encouraged to sign up at this time even if you are not participating in the Trick or Treat event. It gives us a chance to plan events for the entire year, which normally include TGIF’s, Egg Hunts, Summer Concert outing, etc… Membership forms received before or on October 26th will be entered into drawings for door prizes! THANK YOU to the following business for their door prize donations! Also, neighborhood Girl Scout Troop 8391 is planning to build a Free Little Library at the school, and they want YOUR input. Join these fourth-graders at 6:30 p.m. for a very short informational presentation. For information or to donate children’s books, please email the troop at Washingtontroop8391@gmail.com or call Sue, (414) 243-8750. Here is the October-December 2015 Tosa Watch Newsletter.